A man narrowly escaped death after he was attacked by armed robbers early this morning in Awka, Anambra state. 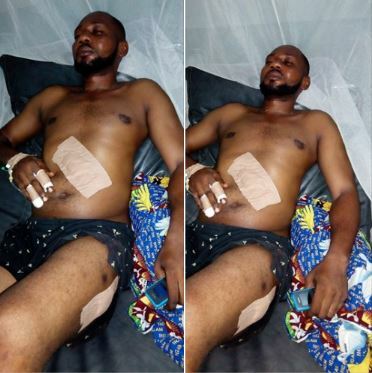 According to Cosmos Chinedu, the victim was robbed and stabbed about 4 times when going to work this morning at Unizik junction in Temp site, the state capital. The victim was rushed to the hospital where he is currently responding to treatment. This is coming a month after 28-year-old Miss Oluchukwu Ezeobi was stabbed to death by unknown assailants during her usual morning early morning exercise in Awka, in the early hours of Tuesday, February 12. She was stabbed several times when two boys accosted and ordered her to hand over her handset to them but she resisted. She was abandoned and left to struggle in the pool of her blood to die; while the assailants dispossessed her of her handset and ran away.